Uber, among the world’s fastest growing companies, deployed SpringCM across their business to unify their contract processes and provide a central repository for documents. ADP, one of the largest global Human Capital Management (HCM) providers, is currently implementing SpringCM as a contract and document repository for their sales organization, providing visibility between departments and scalability to accelerate sales cycles. SpringCM is a Platinum sponsor at Dreamforce 2017, the most inspiring technology event of the year and the world's largest gathering of Trailblazers. SpringCM is exhibiting at booth 1118 in the Dreamforce Customer Success Expo, demonstrating its configurable document and contract management platform. 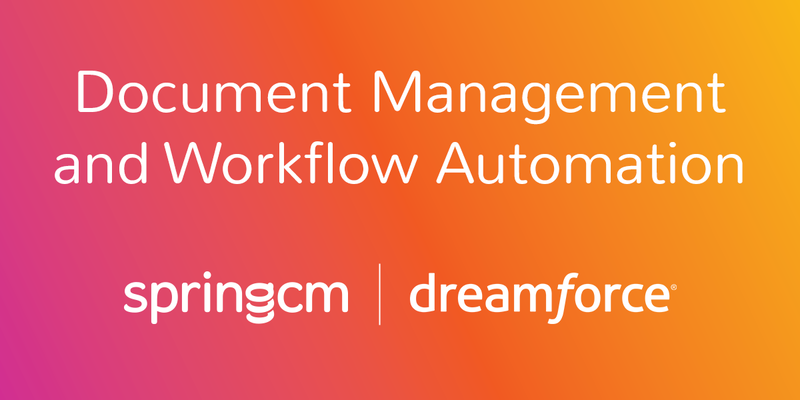 Throughout Dreamforce, SpringCM will showcase customers that have transformed their business processes by automating documents, resulting in increased productivity and revenue. Contracts can be maddening! Where are they? Who’s got them? Who’s signed them? How do we find them when we need them? What about managing NDA, MSA, SOW and other essential documents? Learn how Uber and ADP implemented SpringCM to increase productivity, save time, and reduce risk by automating contracts and documents. SpringCM helps work flow by delivering an innovative document management and workflow platform, that powers the leading contract lifecycle management (CLM) application. SpringCM empowers companies to become more productive by reducing the time spent managing critical business documents. Intelligent, automated workflows enable document collaboration across an organization from any desktop or mobile device. Delivered through a secure-enabled, scalable cloud platform, SpringCM document and contract management solutions integrate with Salesforce, or work as a standalone solution.